These options for finishing the ceiling are entering our lives more and more closely - they are very quickly mounted, they look beautiful and do not require surface preparation. So, today, stretch ceilings are on the agenda, the pros and cons of which we consider in detail. The materials of which two stretch ceilings are made are PVC film and woven fabric. Since these materials have slightly different characteristics, the advantages and disadvantages of these stretch ceilings will also vary slightly, we take this into account when describing their pros and cons. For more information about the types of stretch ceilings, see the material: What are the types of stretch ceilings. This is, of course, a significant plus. 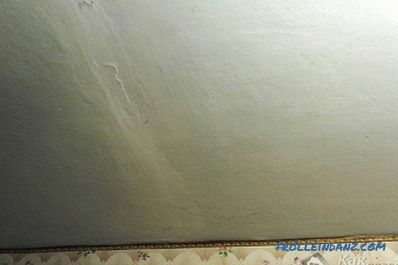 Usually manufacturers guarantee such ceilings from 10 to 15 years of service. But in fact, experience has shown that the actual service life is much longer. 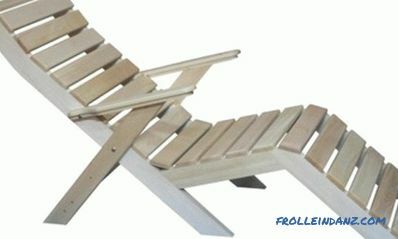 A quality product does not lose any color or technical characteristics. For comparison, we take the painted ceiling of plasterboard - after all, it will be necessary to tint it after a couple of years, and in the case of stretch ceilings it is only necessary, from time to time, to clean them up. Judging by the fact that European apartments everywhere are equipped with such ceilings, they do not pose any health hazard. You understand that there such things are strictly followed. Just what is wrong - prohibit. Well, the fact that the film is made of polyvinyl chloride does not mean at all that it can be harmful - today even children's toys are made of PVC. However, acquiring a stretch ceiling, yet check whether its certificate meets European standards. But now it is very easy to run into a Chinese fake. And this is the main problem on which this advantage of suspended ceilings turns into a disadvantage. At the very beginning, when such ceilings just appeared, they were much more expensive. As time went on, manufacturers became quite a lot, respectively, and the price of suspended ceilings fell. And now, again comparing them with suspended gypsum ceilings, we often get the total amount of expenses below specifically for tension structures. After all, for them, except the canvas, no materials will have to be purchased. But for a false ceiling, except for plasterboard sheets, and the profile is needed, and paint with putty. But: trying to save money, do not fall for the tricks of dishonest sellers. They sometimes give out fakes originally from China for products of popular brands. And lure customers with ultra-low prices, assuring them that they are due to promotions and discounts. Therefore, if the goods are suspiciously cheap, carefully check them (or bypass them). If the bathroom is not the best ventilation, then neither paint nor wallpaper on the ceiling will not last long. A plasterboard ceiling will have to refresh quite often. But the ceiling of the tightly stretched polyvinyl chloride film is not afraid of moisture, without at all spoiling it. Moreover, even a few buckets of water, spilled from above by sloppy neighbors, will withstand such a film. True, this advantage does not apply to fabric stretch ceilings. 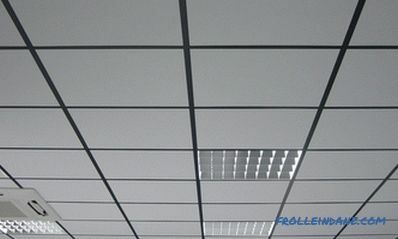 PVC ceiling, which is filled with water from above, after pumping water and carrying out repair activities, in most cases, will be suitable for use. Well, yes - you will not have to tint or change any elements all of 15 years (coverage of no less than this period will last). It will be enough to regularly wipe the ceiling surface with a soft cloth. There will be pollution - use detergent. For PVC ceilings, it is possible to use a glass cleaner, but not the one that contains alcohol. Wiring, ventilation, alarms, fire sensors - all this can be safely covered under the stretched ceiling plane. By the way, no less important is the fact that the original surface requires absolutely no finishing. It can be covered with wallpaper, old peeling paint, or even whitewashed - for a stretch ceiling it does not matter. And again: between the film and the base, if necessary, you can place a heat insulator or sound insulator, which also will not be visible from the room. Oh yes - those who look through the catalogs with suspended ceilings sometimes take their breath away. So many colors and shades, so many textures, so many forms - do not tear your eyes off. The night sky with stars and clusters of planets or a glossy mirrored ceiling of deep color look amazing. A silky satin surface or classic matte will suit those who love comfort and peace.And textures such as suede, metallic or marble look rich and elegant. Important: do not neglect designer services. He will help you choose exactly what is best for your home - after all, he knows all the laws of compatibility of textures and colors. So quickly you can’t mount a single ceiling. And if a simple canvas is stretched at one level, then three hours will be enough. We take into account the fact that there will be no debris in the installation of suspended ceilings. They can be mounted in a room where repairs have already been made, there is furniture and wallpaper is pasted on the walls. The main thing - 0.6 meters from the wall for freedom of movement master leave. 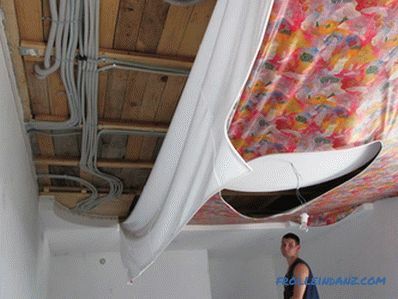 But: when installing PVC film ceilings, still remove furniture, especially expensive. It is better not to risk it, working with a heat gun. Unfortunately, it is extremely easy to pierce something thin with a thin film of polyvinyl chloride. Therefore, in rooms with such ceilings one must be careful with moving high pieces of furniture. And during the celebration of danger may be a cork from champagne, booming shot vertically upwards. Yes, and "darts" should not indulge in, as well as shoot on the ceiling with toy pellets. However, cloth fabrics, unlike PVC, have higher strength. This quality, on the one hand, is a plus. 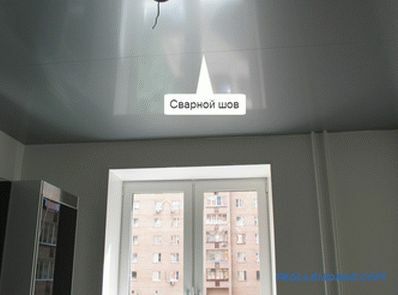 After all, thanks to him, the suspended ceiling can save the room from the "flood". But many believe that all surfaces of the room (including, of course, the ceiling) should "breathe." Naturally in the case of PVC ceilings will not. As for the fabric stretch ceilings, they are deprived of this disadvantage and perfectly breathable. 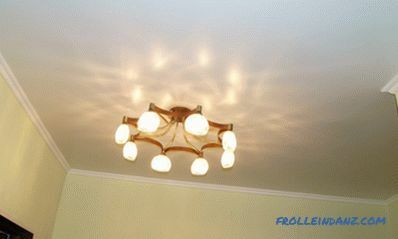 This disadvantage is not so noticeable, except to look hard (naturally, if the ceiling is of high quality). However, in a room up to 5.1 meters wide, you can find a seamless fabric ceiling. PVC ceilings without seams can be found for rooms up to 3.5 meters wide. As you can see, the presence of this small flaw will depend on the type of canvas used and the size of your room. The joints on dull PVC ceilings will be even more noticeable. A new stretch ceiling can smell a little, just like a new jacket or a pair of shoes. It takes several days - and this smell and trace does not remain. But if this is not the case, then there is reason to think about it. An unpleasant "chemical" odor that does not disappear for a long time may indicate that you have a low quality fake. As mentioned above, before buying, certainly ask the seller for a certificate. Unfortunately, this is absolutely true. We'll have to pay the specialists who will install. But let's look for pluses here too. Let him have to part with the nth sum of money, but the time it can be spent on something more pleasant. In addition, the installation will take some three or five hours. Again, if you trust the case to reliable specialists, you will be able to avoid the hassles described below. # 1. Collapse is a frequently encountered drawback when using PVC linens. This means that each time the door knocks, the door folds. To get rid of this effect, you need to make pressure equalization in the room and under the ceiling. By the way, a good master knows this. As a matter of fact, manufacturers do not make any secret of this, providing for the need to equalize the pressure. # 2. When installing the ceiling height, power and angle of illumination are determined approximately, PVC film melting may occur. 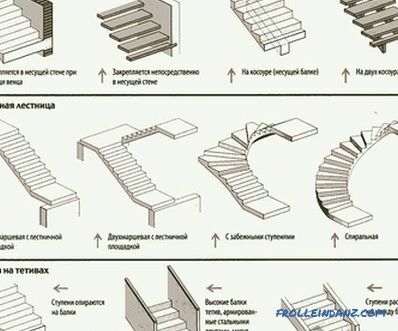 But if you carefully study the technology, you can see that it strictly defines these parameters. No need to once again experiment with lamps, and then everything will be fine. An example of improper mounting of the backlight, in which PVC fabric not only melted, but also cracked from exposure to high temperatures. # 3. When attaching the ceiling to plasterboard sheets, tearing may occur. But this will happen only if the design is not reinforced with a kerchief or a bar. You just need to know that GCR can not bear the load of 70 kilograms per meter (linear). Sagging of the blade Saggy ceiling does not look very aesthetically pleasing.There may be several reasons for this: poor-quality seams, weak tension, poor knowledge of technology. Especially often this happens after the bay from above. 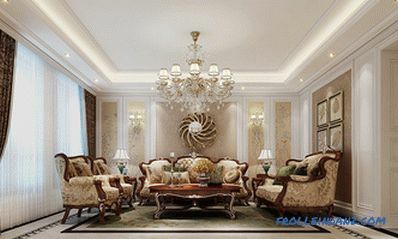 If you turn to specialists in time, the customer service will be able to return the ceiling smoothness and beauty. You see - another argument against self-installation. In this example, the PVC canvas is very slack. 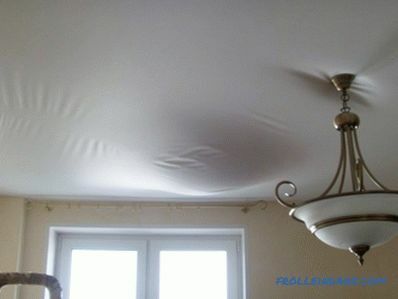 PVC ceilings, as already mentioned, are very unstable to various mechanical damages. These are punctures, cuts, breaks from blows. In addition, PVC film "panic" is afraid of low temperatures. When cooled below zero, it becomes more fragile, and when the frost grows stronger to minus 20 degrees, it is completely destroyed. It can not be washed with detergents, and it is more difficult to care for it than the ceiling of the film. Its moisture resistance is lower than that of polyvinyl chloride. And after flooding the ceiling is not always possible to return the original look. The palette of colors compared with PVC ceilings is much poorer. Unfortunately, this type of ceiling is disposable. When replacing it will have to change the whole frame.